I suppose one should congratulate The Hoffman Agency for opening shop in Indonesia. In their reckoning, until they came around clients in Indonesia had to choose between bureaucratic, international-standard agencies or high touch (whatever that means) local-standard agencies. Unspun supposes that he should take offence because Maverick is not included in their analysis. But then again, if we are included the top right quadrant in the chart wouldn’t be exclusively occupied by Hoffman then, would it? Can even the best PR Experts help the Government? 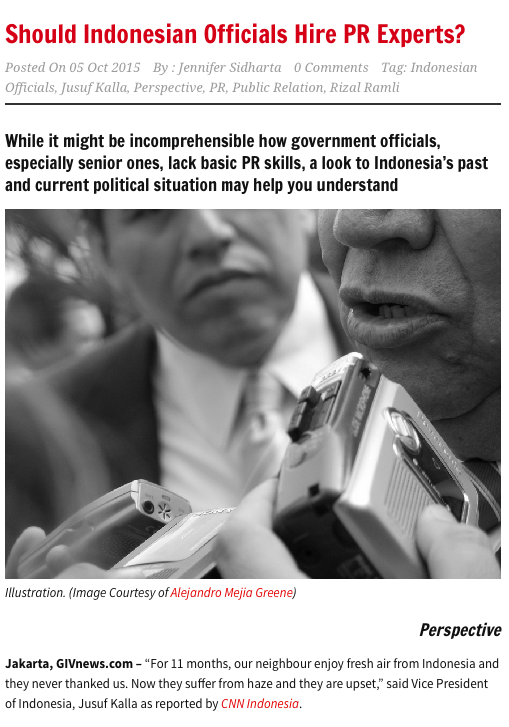 And it is clear that government officials need to learn PR skills, or hire PR persons, to help them building positive image on behalf of Indonesia. If Unspun had written this opinion piece he’d be accused of penning a self-serving article. But he has not and Jennifer Siddharta has said what should be said at GIV. That the Indonesian Government has appalling PR is beyond doubt but one cannot help but wonder if the right cure is a PR expert. If PR means the advice, strategy and execution – that includes media training, messaging, media monitoring as well as its social media equivalents – then even the best PR experts may not be able to help. This is because the root cause of the officials’ PR gaffs is not for lack of PR skill but in the mindset and the logical systems that they go through life with. What sort of a mental process was it that prompted Jusuf Kalla to blurt out the absurd and defensive we-give-them-11-months-of clean-air statement? Other than concluding that Kalla almost certainly has a closed mind set, Unspun feels unqualified to diagnose his problem further. True, the best PR experts should be part psychologists as well as a wide range of interests but what if Kalla and the other officials have such a world view that no amount of persuasion can change their ways? In a corporation you’d go to the boss man and tell him that he either has over them to stick to the script, to muzzle them or to sack them. That is why corporations are usually more efficient that governments. But given the political layout as it is this cannot be done. So the interesting thought experiment is this: If you are a PR expert and approached by the government to help them with their PR to get the ministers on message would you 10 take on the job? and 2) if yes, what conditions would you insist on? And then we are a teenager. 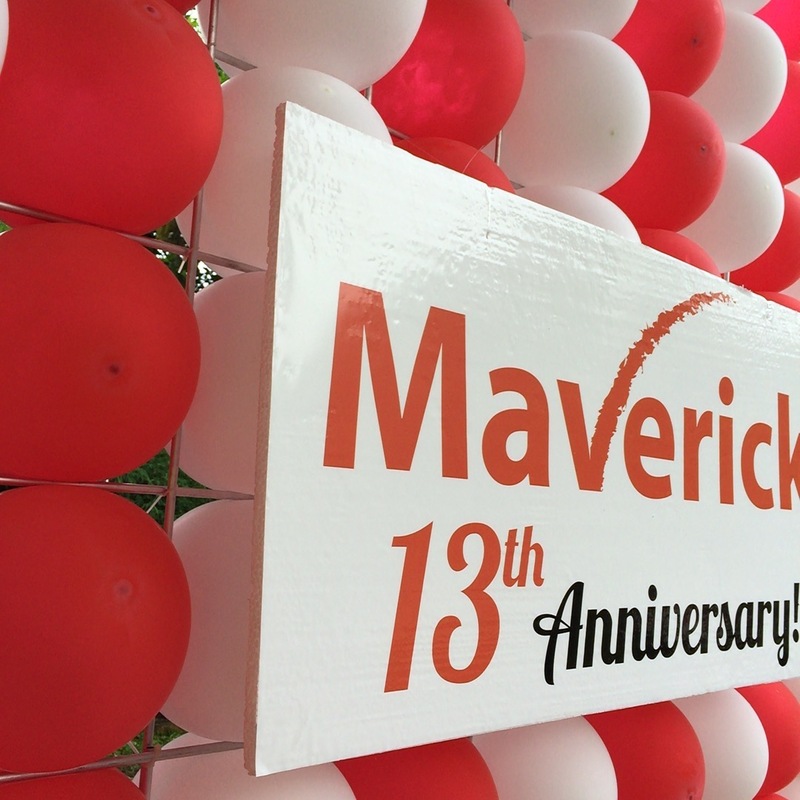 We are the communications consultancy Maverick that turns 13 this month. Fortunately, as an organisation we’ll not be subjected to the mood swings, moods and hormonal surges of human teenagers. I suppose, however, that 13 still represents a landmark of sorts as we grow out of the first flush of “startup” years into an ever more established business – with all the attendant challenges, dangers and opportunities that this brings. Looking back, it has been an exhilarating, frustrating, gratifying, teary and joyful journey rolled into one that saw Maverick grow from a 6-person outfit to what it is today – a communications consultancy with over 75 employees and a reasonably handsome profit. The most exciting aspect about Maverick, however, are the people who have been and are the Mavbros and Mavchicks. For my business partner Lita and me, there is no greater reward than to see the Mavbros and Mavchicks – who are usually fresh from university – take their first tentative steps and then blooming into formidable and thoroughly first-rate consultants and trusted advisors once they have gone through the Maverick treadmill. I think we have seen dozens of young men and women come into Maverick, stayed for a while – some shorter, some longer – but almost all of them taking away with them new-found hard and soft skills and friendships that will last them a lifetime. Many who left went on to great jobs with multinational companies and established institutions. Others opted for the family life and still others went off for further studies. very few consultants – I think three or four in 13 years – went straight to our professional rivals. Even then many of them usually profess to have very fond memories and visceral feelings for Maverick. In the early days we tried very hard to retain people. These days, however, we realise that the impulse to move on to new things comes with the age group of the people we employ. Gen Y, Z and Millienals have this instinct to seek new pastures every two or three years. That’s life and we’ve come to terms with that. So what we now do is to develop a process of on boarding new recruits very fast and have them nurture, mentor and train new recruits to step up to the plate as they near the time when their Millennial instincts give them itchy feet. So far it has worked and we are so very happy and proud of the institution we have become. Maverick, if we hear what people are saying are correct, is virtually not only a training centre but also a finishing school for those who aspire to become the best communications professionals after school. When they join us they not only get the training but they get a buddy to make sure they fit in. After that they come under the attention of supervisors who double up as mentors and friends to help them make the most of their talents. Yet for all the supportive culture we have it is not some la-la land type of organisation. 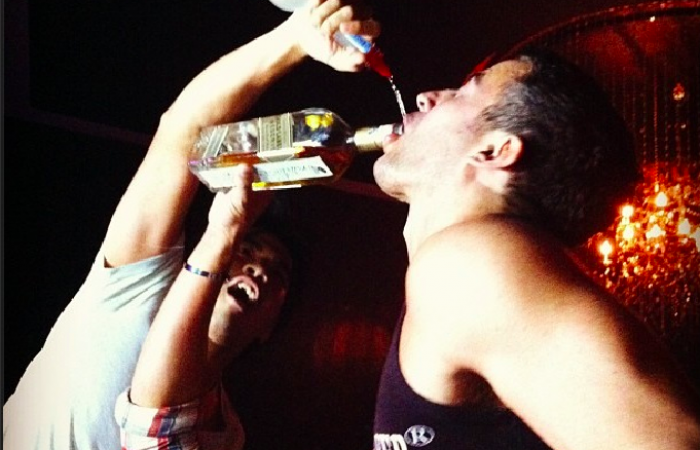 When we work, we work very hard and insist on the highest standards.And then we play hard. The result is a self-renewing crop of bright talents that would be the envy of any creative consultancy not only in Jakarta but anywhere in the world. We are very proud of them, these Mavbros and Mavchicks, so proud that we think that their loved ones should also share in some of our pride. That’s the reason why we’ve chosen to hold a “Carnival” – complete with cotton candy floss, popcorn, clowns and magicians – where the Mavbros and Mavchicks can invite their spouses, partners or families along. We want them to know of these incredible young men and women who work for us, to give them an idea of the office and atmosphere where our consultants spend 8 to 10 hours of their day away from them (we discourage our staff from spending any more time in the office as we believe that the best consultants are those who have full lives outside the office).We want them to share in the experience of our consultants, for their children to know where their father or mother works, for parents to know where their daughters and sons disappear to every working day and the kind of company they keep in the workplace. And also the kind of work they do (a real challenge since very few people outside PR know what we actually get up to – try devising a way to explain PR to the kids). But now the music has started up, the families have begun to arrive and I have to go celebrate the achievements of Mavbros and Mavchicks present and past. In 1985 Pulitzer prize-winning author Barbara Tuchman wrote the book The March of Folly which was a fascinating study of why leaders from Troy to Vietnam acted against their own self-interest. If she were updating the book today, Unspun thinks she would certainly consider not only adding Malaysian Premier Najib Razak but perhaps promote him to the front line of the phalanx of marchers. Najib’s march, where his public image was concerned, actually began in 2009 when, critical bloggers began to expose his foibles and questioned his involvement in the Alantuya affair, where a Mongolian model was killed by the Premier’s bodyguards and then her body was disposed using C4 explosives. There were rumours — all unproven in a court of law controlled by the Malaysian government – that she was somehow romantically involved with Najib and the bodyguards acted under orders from the highest leadership in the land. Assailed by bloggers, who enjoyed a freedom of expression that the legacy press in Malaysia did not have, Najib made the decision of employ US lobbying and communications firm APCO to pull him out of the mess. It was a strange choice because Najib’s problems had nothing to do with communications but everything to do with his character, his evasiveness and the decisions he was unwilling or unable to make. He was virtually un-PRable but the fat fees he offered APCO prompted the company to embark on a March of Folly of its own: It accepted the appointment. Critics, including Unspun (see link here) felt that it was an expensive exercise in futility and after many months and millions of taxpayer’s dollars were spent, APCO achieved nothing and its contract was not renewed. That didn’t deter Najib to forge on in his march though. In spite of an absence of results he apparently retained the head of APCO Malaysia, a certain Ralph Stadlen to continue advising him. Consistent with the deliverables of APCO, the results of Stadlen’s work was not apparent to anyone. Najib’s reputation continued to plummet, especially when the 1MDB scandal broke. The government, in the story below, has denied that it is paying for Mr Stadlen’s elusive services and claims no knowledge of his existence. This is all an old trick. Instead of paying him from official coffers, they must have got a crony to pay him from their own corporate coffers in return for favours. At any rate Mr Stadlen must cost a bomb, considering his rather flamboyant and public lifestyle (see here). Now Najib has taken another step forward in his good march. Besieged by crumbling popular support even within his own political party Umno and stinging from the potshots fired by former premier Tun Mahathir Mohamad has taken to appointing former adman Lim Kok Wing to address his reputational concerns. The tragedy here is that everyone knows that Lim Kok Wing, talented as he is, cannot save nab from his deeds, himself and his wife. Yet the March of Folly is so compelling that Najib is trying once again to classify his problems as communications-based and outsource it to a communications expert. But the intriguing question here is what Lim to embark on his own March of Folly? Why when he has no apparent need for the money, take on a job with impossible odds – the pundits are now counting the days before Najib exits the national stage. Why take on a mission impossible and in the process tarnish his own image when Najib ultimately falls? Did Najib offer him an irresistible deal? Did Najib blackmail him into taking on the job? Or is Lim such an adventurer that he would march on where even angles fear to tread? Who has the answer out there? Advertising man Tan Sri Lim Kok Wing, who has run Barisan Nasional’s election campaigns, is Datuk Seri Najib Razak’s new public campaign coordinator in a charm offensive to win over Malaysians and shore up the prime minister’s flagging popularity. Lim rode high during Tun Dr Mahathir Mohamad’s administration, but the former prime minister is now Najib’s harshest critic. It was learnt that Lim, who has been appointed “special programme coordinator”, has drawn up plans for Najib to go nationwide to gather support and listen to the complaints from the people. 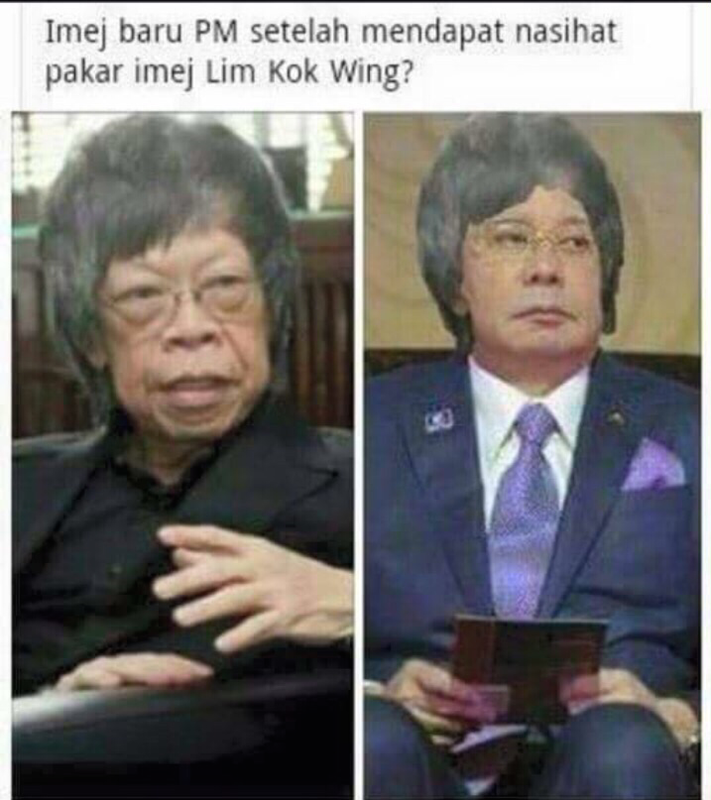 Lim, who founded the Limkokwing University of Creative Technology, will report directly to the Prime Minister’s Office which already has a string of advisors. The 69-year-old, who set up Malaysia’s first local advertising agency, has been involved in election campaigns for almost four decades. In 1994, Lim, on recommendation by Dr Mahathir, was tasked by the late Nelson Mandela in South Africa’s first free elections, giving his African National Congress (ANC) the slogan, “A Better Life for All”. He also conceptualised and ran Putrajaya’s “Tak Nak” anti-smoking campaign and promoted the “Rakan Muda” and “One Heart, One Nation” programmes. This latest appointment came months after Lim was first appointed as “Goodwill Ambassador” in the Prime Minister’s Department in a Tolerance Day celebration that his university hosted in November last year. Now, Lim has to run a fully political campaign for the embattled Najib against Dr Mahathir who has openly asked the prime minister to step down over the 1Malaysia Development Berhad (1MDB) scandal. In 1975, Lim started Malaysia’s first local advertising firm and went on to start Limkokwing Institute of Creative Technology in 1991, before it became a private university in 2000. He also sits on the Malaysian Anti-Corruption Commission’s (MACC) consultation and corruption prevention panel. Lim now joins the list of four official advisors to Najib – Datuk Seri Dr Abdullah Md Zin, Datuk Johari Baharum, Tan Sri Rais Yatim and Datuk Seri Shahrizat Abdul Jalil. It was also recently reported that public relations firm Apco Malaysia’s Paul Stadlen, had also served in the prime minister’s National Communications Team. The status of Stadlen’s alleged role in the government remains unclear with Putrajaya saying it did not pay any wages to the former Apco Malaysia boss. “To date, the government did not pay any salary to Paul Stadlen,” Minister in the Prime Minister’s Department, Datuk Seri Shahidan Kassim told PAS’s Hanipa Maidin in a written reply in Parliament on Wednesday. Hanipa had asked about the amount paid to Stadlen who was purportedly a member of the communication team at the Prime Minister’s Office. However, the reply was silent on whether Stadlen was part of the team. – May 22, 2015.